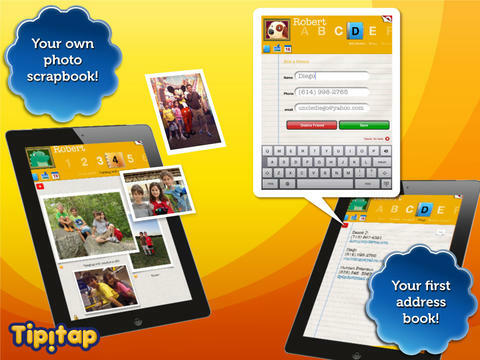 iDiary For Kids is a powerful journaling app for children. 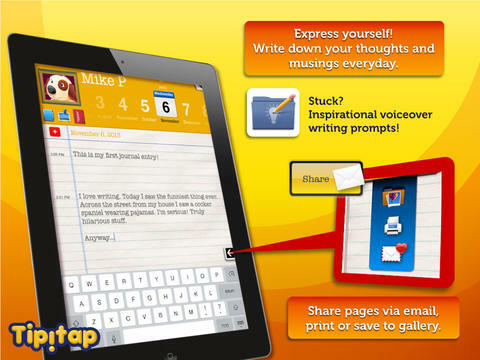 It enables them to write creative personal journal entries, upload photos and draw pictures. 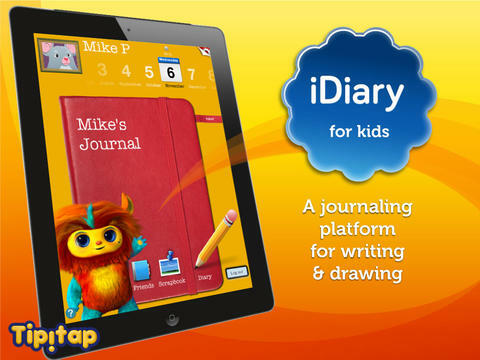 iDiary for Kids is an ideal platform for children ages 5-13 to plunge into journaling. Keeping a journal or a diary helps children improve their writing skills, develop their creativity and boost their self-confidence. 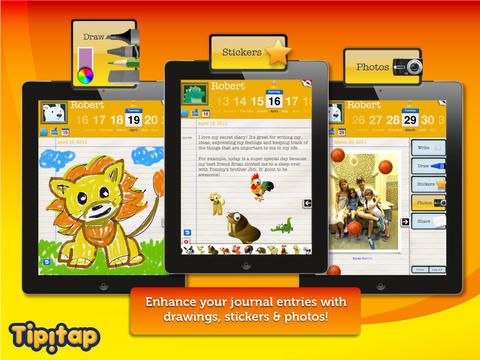 Beautifully designed, iDiary for kids has a daily journal at its heart where kids can express themselves periodically writing, drawing, pasting photos. They can easily navigate to their old entries and explore their past musings through an intuitive calendar navigation system. iDiary not only allows for typing in entries, but also for drawing or writing on the screen with your finger or a stylus. Our drawing engine is the same as our award winning Color & Draw for kids (winner of the Children Technology Review Editor's Award 2010). iDiary adds a whole new layer of possibilities to journaling, allowing students to easily share the entries that want to showcase while keeping the rest of the diary private. If children get stuck, there are writing voice prompts for inspiration. It also has a photo scrapbook/album and an address book. Diaries are also password protected for privacy. Teachers across the world are turning to journal writing as a tool for developing and enhancing their student's writing skills. Research shows that students who write journals become more interested in writing and that the overall quality of their writing improves. Since students are not judged on their writing skills, and are given free rein to express themselves on what is important to them, the use of a journal or diary among students promotes expression, self-confidence and creativity. 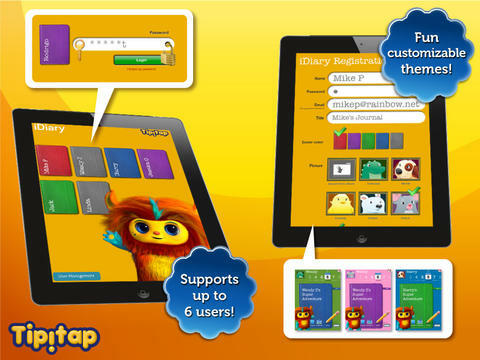 Tipitap publishes critically acclaimed and award winning apps for children. Our mission is to unleash the potential of the technologies that converge on these platforms to educate and entertain the kids—ages 1 through 9. We make available a wide range of interactive apps that weave together images, text, sound and touch in a seamless experience of fun and learning.